Birth: 27 July 1824, Barnstead, Belknap County, New Hampshire. 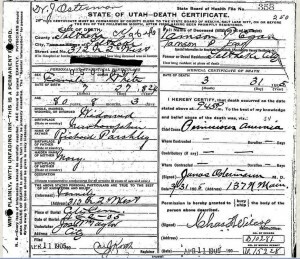 Death: 31 March 1905, Salt Lake City, Salt Lake County, Utah. Died at age 80. Husband: Howard Egan (1815 -1878). 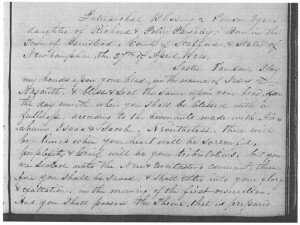 Married 1 Dec 1838, Salem, Essex County, Massachusetts. 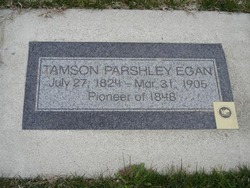 Tamson was born on July 27, 1824 in Barnstead, New Hampshire, situated 65 miles north of Boston. She was born to Richard Parshley and Mary Caverly, and was the sixth of their eight children. The family continued to live in New Hampshire, bordering Massachusetts. In 1838 Tamson met Howard Egan, a rope maker in Salem, Massachusetts. They were married on December 7, 1839. Howard was 23 years old; Tamson was 14. They settled in Salem, Massachusetts where their first two sons were born – Howard Ransom Egan on April 12, 1840, and Richard Erastus Egan on March 29, 1842. 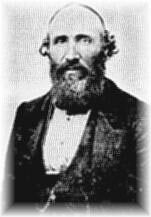 In 1842 Elder Erastus Snow introduced Howard and Tamson to Mormonism. They were baptized and moved to Nauvoo, Illinois that same year to be with the body of the saints. When they reached Nauvoo, they met the prophet Joseph Smith, who quickly hired Howard as one of the Nauvoo Police and also as his personal bodyguard. After arriving in Nauvoo, they moved into a little two room house. They lived in the room on the right and another family lived in the room to the left. Howard opened a rope making business close to the river, where Tamson would meet him daily to take him dinner. On Sept. 24th 1844 Tamson and Howard each received a Patriarchal blessing under the hands of Hyrum Smith. (A copy Tamson’s blessing is shown above.) Shortly thereafter, in keeping with the principal of plural marriage, Hyrum Smith married 29-year-old Howard to a second wife, 40- year-old Catherine Reese Clawson Egan, a widow with four living children. The saints were persecuted harshly in Nauvoo and their beloved prophet was murdered in 1844. The saints lasted in Nauvoo for about two more years when they were finally driven out. 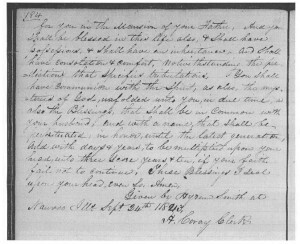 While in Nauvoo, Tamson bore another son, whom they named Charles John Egan. The child died a year later, in 1845. Howard, Tamson, and their two surviving sons left with the general exodus of the Saints on March 1st 1846. 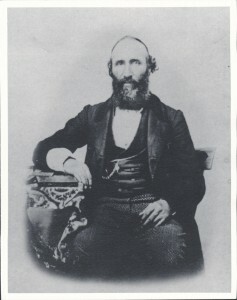 Howard had become an adopted son of Heber C. Kimball, and during the exodus from Nauvoo the Egans traveled across Iowa with the Kimballs. Howard, Tamson, and children spent the winter of 1846–1847 at Winter Quarters, although Howard had to make several difficult trips down to Missouri to bring back supplies for the Saints. In his diary, Howard Ransom Egan described the home his father built: “Howard Egan’s log hut was neatly arranged and papered and hung with pictures and otherwise decorated by his Wife, which made it very pleasant and habitable.” Winter Quarters was a settlement that consisted of 700 houses of log, turf and other materials; and was laid out with streets, workshops, mills, etc., and a Tabernacle for worship. Winter Quarters was on a pretty plateau overlooking the river, and was built for protection from Indians. There were 22 Wards with a bishop over each, also a High Council. The population was over 4,000. 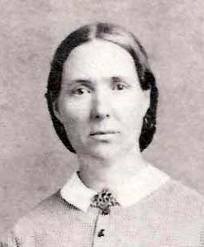 In 1846, while in Winter Quarters, Howard married a third plural wife, 21-year-old Nancy Redding (aka Redden). In 1847 Howard was selected as one of the 143 men who would form the vanguard company to blaze the way to Salt Lake Valley for the rest of the Saints, and was appointed captain of the 9th group of 10 men. He left Tamson with child in their comfortable log cabin at Winter Quarters, and started west toward the Great Basin. This left Tamson alone in Winter Quarters for about a year. 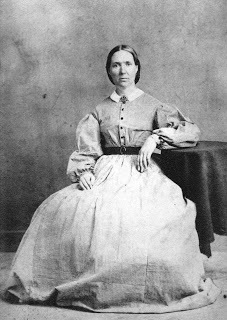 Tamson was often left alone to care for her family during most of her married life, a result of the many assignments Howard received from the church, his various businesses, and time spent with his other wives and children. Howard and the bulk of the vanguard company entered the Salt Lake Valley on July 24th 1847. During his absence from Tamson, she gave birth to another son, Horace Adelbert Egan, on August 12th 1847. This child would later die at age fifteen. Howard returned to Winter Quarters on October 31st 1847, spent the winter with his family, and then departed for Salt Lake with Tamson and children on May 24th 1848. It was a rugged trip for a girl of 23 with three young boys. Many times the only fuel she had to cook meals with, were buffalo chips. Her second son, Richard Erastus Egan, was only five years old when he fell under the moving wagon. He would have escaped, but for a big pig that was tied to the wagon, and in his trying to get out of the animal’s way, the wagon wheel ran over his foot. Richard Erastus rode the rest of the way to the Salt Lake Valley in the wagon. Howard, Tamson, and children arrived in Salt Lake City on September 24, 1848 and promptly moved into the Salt Lake Fort. There were 423 apartments the saints were supposed to share within the fort. This is where they lived for about two years. The year of their arrival was also the same year that the crickets threatened to eat all of the crops, when thousands of seagulls came from nowhere and saved them. “Of late years I often think of what a hard life Mother had in pioneer days, but I suppose that was the lot of all the pioneers; digging roots and gathering greens, catching fish in the Jordan River, collecting anything eatable to make what little flour and cornmeal we had last till another supply could be procured, was the common lot. Wood was also scarce, even the bark of the fence poles was stripped off for fuel, for the men could not spare the time to haul wood from the canyons. During this time of living in the Fort, Howard married a fourth wife, 18-year-old Mary Ann Tuttle, and left once again to go back to Council Bluffs and bring his third wife, Nancy Redding, back to Utah. They arrived in August of 1849, and he was immediately sent to go on a Gold Rush mission to California – to collect gold to help the church grow. Following the custom of Mountain Justice, Egan killed the seducer of his wife. He was defended in the subsequent murder trial by W.W. Phelps and Apostle George A. Smith. 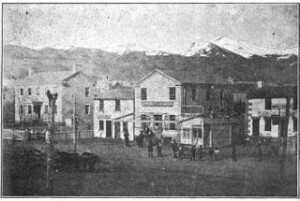 Egan was acquitted due to the jury believing this was justifiable homicide based upon Utah’s “Mountain Common Law.” On March 6, 1852, the Territorial legislature passed the Justifiable Homicide Act, as a direct result of the Egan case. The Act stated that it would be: “Justifiable homicide to kill the person who defiled a “wife, daughter, mother, sister or any other female relative or dependent.” This law was in place until 1874. Howard continued to be away from home frequently and left Tamson and the children to take care of things themselves. Once when he returned from one of his trips, he got together with two men and bought a city lot to build a very large barn to use as a livery stable. One day while Howard was again gone on travels, the barn caught on fire. The boys were away and saw the fire as it spread to their house in the distance and rushed home to see what they could do, but were too late. They arrived and saw that the barn was now only a pile of ashes and found Tamson sitting amid the few household goods she had managed to save. The house was largely damaged and they lost all of their chickens, two horses, about thirty tons of hay in the barn, and the grain room that had been full of oats and barley. There were four sets of harness and some saddles in the harness room. All went up in smoke, along with many carpenter tools. The flames had spread so rapidly that it was impossible to save much that was in the barn. They lost thousands of dollars with that event. Tamson had given birth to six children. Charles John Egan had died as a baby, and Horace Adelbert had died when he was fifteen. 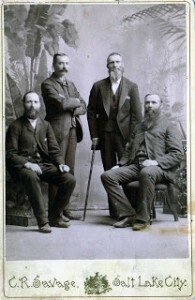 The four surviving sons: Howard Ransom Egan, Richard Erastus Egan, William Monroe Egan, and Ira Ernest Egan, are shown in the picture to the left. After the death of President Young, Egan was appointed as the special guard at Brigham’s grave in Salt Lake City. William Egan said that “in March 1878 Father got his feet wet one dark night [while guarding Brigham’s grave] and took sick, which resulted in inflammation of the bowels.” Less than two weeks later he was dead, at age sixty-two. Tamson was the only spouse still married to Howard at the time of his death – the other three having divorced him. Tamson continued to live until 1905 when she passed away from Pernicious Anemia on March 31, 1905 at age 80. She is buried in Salt Lake City, Utah next to Howard in the Salt Lake cemetery.